The Confederation of Indian Industry (CII) has announced Shaji Ravi, President and Managing Director of Access Healthcare, as the Entrepreneur of the Year 2017. The Confederation of Indian Industry (CII) has announced Shaji Ravi, President, and Managing Director of Access Healthcare as the ‘Entrepreneur of the Year 2017’ at CII’s Connect 2017 conference in Chennai. The award recognizes Shaji’s relentless strategic work as an entrepreneur in building and growing Access Healthcare from three employees to over 8,000 employees in less than six and a half years. The award was conferred by Dr. M. Manikandan, Minister for Information Technology, in the presence of other reputed dignitaries from the industry, government bodies, and academia. 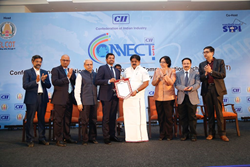 CII has been organizing CII CONNECT in Chennai, India for the past 15 years. The CONNECT series has been the forum for Indian ICT industry to confer on latest trends and developments. This premier annual Conference and Exhibition on Information and Communication Technology has been focusing on Tamil Nadu’s growth in the ICT Sector. Access Healthcare provides business process outsourcing and applications services, and robotic process automation tools to healthcare providers, payers, and related service providers. We operate from 12 delivery centers in the US, India and the Philippines, and our 8,000+ staff is committed to bringing revenue cycle excellence to our customers by leveraging technology, emerging best practices, and global delivery. Based in Dallas, we support over 125,000 physicians, serve 80+ specialties, process over $50 billion of A/R annually, and ascribe medical codes to over 10 million charts annually. To learn how Access Healthcare can help your organization boost its financial performance, visit accesshealthcare.org.